Gayatri taped for an episode of Vogue BFF on Tuesday wearing a polka dotted top and matching skirt from Caroline Constas with block sandals. She was also seen wearing the top while having dinner at a local eatery just a few weeks ago, but paired with denims and a yellow Fendi drawstring bag. Prefer her in the skirt or the denims? We think she looked good in both. 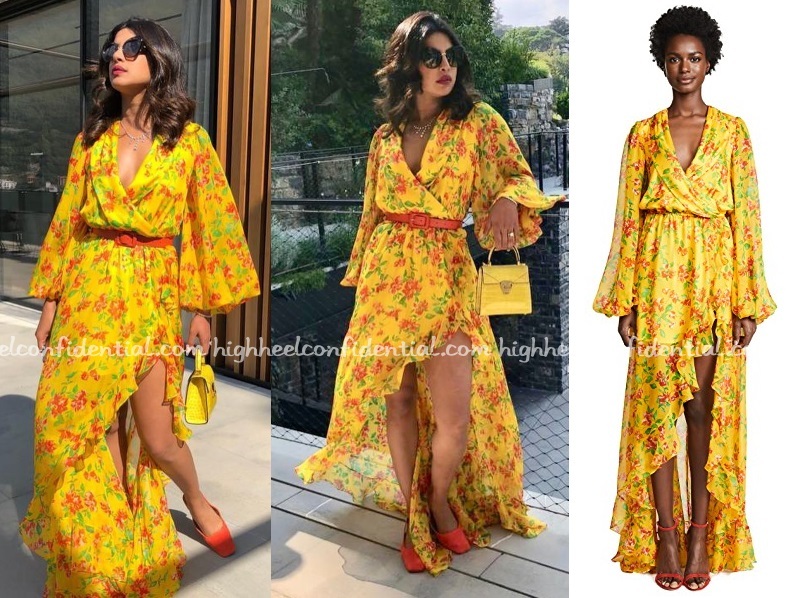 Priyanka, who was in Lake Como over the weekend for the Ambani/Piramal engagement bash, shared pics from the location on Sunday wearing a cheery floral Caroline Constas ruffle dress. She looked good in the dress but I can’t bring myself to like those pumps. I know the style is all the craze these days but just haven’t been able to warm up to them.